You are here: Home / Articles / 1960 Mercedes-Benz 190SL - Choose It or Lose It? We’re in Scottsdale, with seemingly the rest of the world, for one of the great automotive spectacles of each year – Scottsdale Auction week. With an anticipated quarter of a billion dollars worth of vintage autos trading hands, it’s the annual snapshot of the market that the whole world will pay attention to. 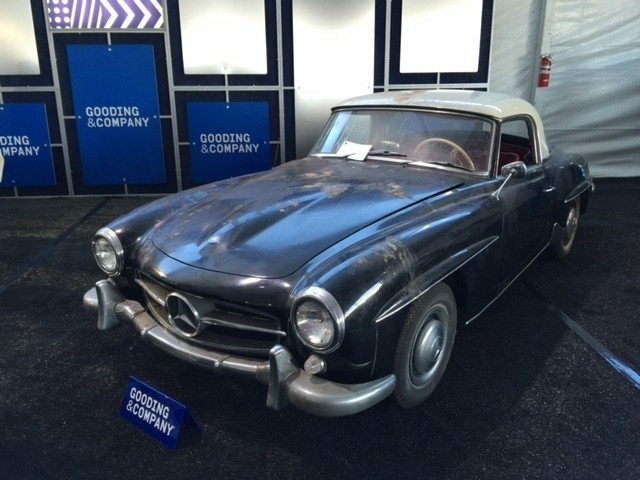 Jeff Broadus was intrigued by this 1960 Mercedes-Benz 190 SL at Gooding, and it’s no wonder – found after decades of storage, it’s right on the cusp of needing a restoration…or is it? Without doing too much, the consignor had it running, and then, left everything else alone. So, what’s this project in waiting worth? On the good side, it’s the original black paint and red interior the car was shipped with, and the purchase includes the factory hard top and records back to 1969. It’s all there, and appears to be completely original – not bad for a 56 year old car. Of course, the naysayers will point out that a 190 SL just isn’t a powerful car, and that the recent drastic market appreciation of these cars into the six-figures area means they are already over-valued. The car’s auction description says that according to Mercedes-Benz factory records, this 190 SL was originally finished in Black (DB 40) with Red Leather (1079) upholstery and delivered to the US, where it was sold through their New York distributor. Believed to be a Southern California car from new, the 190 SL’s first recorded owner was San Diego resident Mr. Hake, who acquired the car in 1969. In 1980, ownership transferred to a Mr. Petruzzo Jr. and then, in 1982, a Ms. Musil purchased the 190 SL so she would have a matching car to her boyfriend’s 300 SL. Wearing a rare factory hardtop and registered on blue-and-yellow California plates, the 190 SL was enjoyed as a fun weekend car until the mid-1990s, when Ms. Musil applied for non-operational status. For the past 20 years, the Mercedes- Benz has been confined to Ms. Musil’s two-car garage in San Diego, where it has remained in static storage, parked alongside Mr. Thompson’s 1957 300 SL Roadster. Presented today with a file of registration and service records, the oldest dating to August 1969, this long-lost 190 SL is an ideal candidate for a concours-quality restoration or sympathetic recommissioning. Given its appealing factory specification and charming provenance, this remarkable find is sure to pique the interest of Mercedes-Benz enthusiasts the world over. The auction company, Gooding and Co, places the estimate between $50 and $70K, and the car is selling at No Reserve. So, what do you say, America – Choose It or Loose It?